Australian manned Mars expedition. Study 2006. 2001 design study by the Mars Society Australia that incorporated many innovative elements to produce a minimum-mass non-nuclear Mars expedition concept. Status: Study 2006. Gross mass: 694,000 kg (1,530,000 lb). Specific impulse: 450 s.
Mission architecture similar to the Zubrin and Weaver 'Semi direct' approach, adopted by NASA for their Design Reference Missions. Best science return allowed by these constraints. Low earth orbit launch vehicle payload capacity of 130 metric tons, slightly more than the 125 metric ton payload expected from NASA's Aries 6 booster then in the planning phase. Exclusion of nuclear power meant reliance on solar power, placing a limit on available electric power. A solar cell farm on the Martian surface, with an efficiency of 10 W/kg would provide 40 kW of power in daylight. This would be equivalent in mass to an SP100 Type 7 nuclear generator providing 100 kW of continuous power. The power limit limited on the amount of rocket fuel that could be manufactured on Mars, the number of crew that could supported on the surface, vehicle surface operations, and most importantly the size and delta-V available for the Mars ascent vehicle. A 30 kW ISRU plant could manufacture enough liquid oxygen and methane over 18 months for a small Mars ascent vehicle which could ferry the crew into a low Mars orbit to rendezvous with another vehicle for earth return. Therefore a Mars Transfer Vehicle(MTV), would be needed to house the crew for interplanetary transit and have to wait in low Mars orbit during crew surface operations. Habitat (Hab), LEO mass: 62 metric tons. This would travel to Mars, aerobrake into a 500-km altitude low orbit, and wait for the crew to arrive in the MTV. Following crew transfer, it would land on the Martian surface and become the core of the 4-crew Mars station. The vehicle had a unique biconic horizontal landing configuration, similar to that of the 60-metric ton Soviet Expeditionary Apparatus concept of 1972. The Hab consisted of the crew cabin, aft propulsion module, heat shield, landing engines and parachutes. The propulsion module would be removed after landing to allow the Cargo Vehicle to be mated with the Hab, forming a larger station. Cargo Vehicle, LEO mass: 62 metric tons. This would transport equipment to the Martian surface direct from earth two years prior to the arrival of the crew. It would have the same aerodynamic shape, propulsion module, heat shield, landing engines and parachutes as the Hab. The forward section consisted of the Mars Ascent Vehicle (MAV), hydrogen stock fuel and an in-situ resource utilization processing plant. The rear section included a detachable garage carrying a pressurized rover and surface supplies for the crew. Mars Ascent Vehicle (MAV), dry mass: 4 metric tons. This lightweight vehicle, located in the forward section of the cargo vehicle, would take the crew from the Mars Surface to low Mars orbit (delta-V 5.7 km/sec), after fuelling with 14 metric tons of liquid oxygen/liquid methane propellants generated by the ISRU plant. it could accommodate 4 to 6 crew with a 2 day flight duration to a docking with the MTV in a 500-km altitude Mars orbit. Mars Transfer Vehicle (MTV), LEO mass: 130 metric tons. 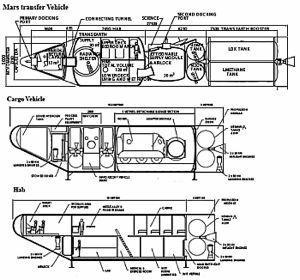 This transported the crew from low Earth orbit to low Mars orbit and later back to earth. Capture into Mars orbit was by aerobraking. It would dock with the Hab module in low Mars orbit. The crew would then transfer to the Hab for landing. The MTV remained in low Mars orbit while the crew were on the surface. After ascent from the surface with the MAV and docking with the MTV, the MTV would transport the crew back to Earth from low Mars orbit. The crew would enter a 5-metric ton reentry capsule based on the Big Gemini concept of the 1960's as they approached earth. They would then separate from the MTV and land on earth in the capsule. The MTV consisted of a the 43-metric ton habitation module (including a water lined solar storm radiation shelter), the landing capsule, a 6-metric ton heat shield, a 16-metric ton science and supply module (jettisoned in Mars orbit prior to departure for earth) and a 60 metric ton liquid oxygen/liquid methane-powered propulsion module for the 2.4 km/sec Mars escape maneuver. 16 metric tons of supplies aboard would sustain four crew for the 400 days spent in transit between the planets. Trans-Mars Stage (TMS), LEO mass: 110 metric tons. This liquid hydrogen / liquid oxygen powered stage would boost the modules on trans-Mars trajectories from low earth orbit (delta-V 3.7 km/sec). A total of four stages would be required: One TMS each to boost the HAB and Cargo vehicles to Mars, and two TMS's docked in series to boost the MTV to Mars. The mission design allowed for extended surface operations, a side-trip to Phobos, and numerous contingency abort scenarios, while using non-nuclear propulsion and power and having half the mass of other typical expedition scenarios. Family: Mars Expeditions. Country: Australia. Launch Vehicles: Mars tactical rocket, Ares FBB. Propellants: Lox/LH2. Bibliography: 4486.